The logical architecture of gNB is shown in figure below with Central Unit (CU) and Distributed Unit (DU). 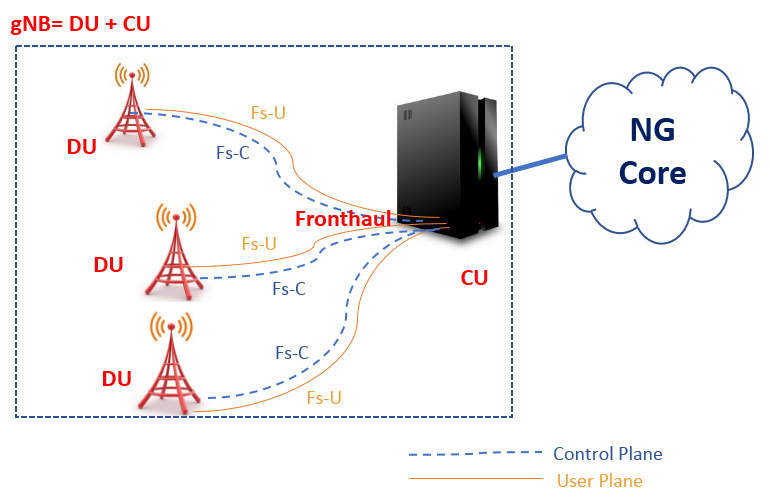 Fs-C and Fs-U provide control plane and user plane connectivity over Fs interface. In this architecture, Central Unit (CU) and Distribution Unit (DU) can be defined as follows. Distributed Unit (DU): This logical node includes a subset of the gNB functions, depending on the functional split option. Its operation is controlled by the CU. Distributed Unit (DU) also known with other names like RRH/RRU/RE/RU. As a part of study item for New Radio (NR), 3GPP started studying different functional splits between central and distributed units. For the initial phase, 3GPP has taken LTE protocol stack as a basis for the discussion, until RAN2 defines and freezes the protocol stack for New Radio (NR). They have proposed about 8 possible options shown in below figure. Option 1 (RRC/PDCP, 1A-like split): In this split option, RRC is in the central unit while PDCP, RLC, MAC, physical layer and RF are kept in the distributed unit. Thus the entire user plane is in the distributed unit. Option 2 (PDCP/RLC split): Option 2 may be a base for an X2-like design due to similarity on U-plane but some functionality may be different e.g. C-plane since some new procedures may be needed. There are two possible variants available in this option. Option 2-1 Split U-plane only (3C like split): In this split option, RRC, PDCP are in the central unit. RLC, MAC, physical layer and RF are in the distributed unit. Option 2-2: In this split option, RRC, PDCP are in the central unit. RLC, MAC, physical layer and RF are in the distributed unit. In addition, this option can be achieved by separating the RRC and PDCP for the CP stack and the PDCP for the UP stack into different central entities. This option splits the RLC sublayer into High RLC and Low RLC sublayers such that for RLC Acknowledge Mode operation, all RLC functions may be performed at the High RLC sublayer residing in the central unit, while the segmentation may be performed at the Low RLC sublayer residing in the distributed unit. Here, High RLC segments RLC PDU based on the status reports while Low RLC segments RLC PDU into the available MAC PDU resources. Low RLC may be composed of transmitting TM RLC entity, transmitting UM RLC entity, a transmitting side of AM and the routing function of a receiving side of AM, which are related to downlink transmission. High RLC may be composed of receiving TM RLC entity, receiving UM RLC entity and a receiving side of AM except for the routing function and reception of RLC status reports, which are related to uplink transmission. Option 4 (RLC-MAC split): In this split option, RRC, PDCP, and RLC are in the central unit. MAC, physical layer, and RF are in the distributed unit. Therefore, by splitting the MAC layer into 2 entities (e.g. High-MAC and Low-MAC), the services and functions provided by the MAC layer will be located in the Central Unit (CU), in the Distributed Unit (DU), or in both. An example of this kind distribution given below. In High-MAC sublayer the centralized scheduling in the High-MAC sublayer will be in charge of the control of multiple Low-MAC sublayers. It takes high-level centralized scheduling decision. The inter-cell interference coordination in the High-MAC sublayer will be in charge of interference coordination methods such as JP/CS CoMP. In Low-MAC sublayer the time-critical functions in the Low-MAC sublayer include the functions with stringent delay requirements (e.g. HARQ) or the functions where performance is proportional to latency (e.g. radio channel and signal measurements from PHY, random access control). It reduces the delay requirements on the fronthaul interface. Radio specific functions in the Low-MAC sublayer can for perform scheduling-related information processing and be reporting. It can also measure/estimate the activities on the configured operations or the served UE’s statistics and report periodically or as requested to the High-MAC sublayer. Option 6 (MAC-PHY split): The MAC and upper layers are in the central unit (CU). PHY layer and RF are in the DU. The interface between the CU and DUs carries data, configuration, and scheduling-related information (e.g. MCS, Layer Mapping, Beamforming, Antenna Configuration, resource block allocation, etc.) and measurements. Option 7 (Intra PHY split): Multiple realizations of this option are possible, including asymmetrical options which allow obtaining benefits of different sub-options for UL and DL independently. This option requires some kind of compression technique to reduce transport bandwidth requirements between the DU and CU. In the UL, FFT, and CP removal reside in the DU and for the two sub-variants, 7-1 and 7-2 are described below. Remaining functions reside in the CU. In the downlink, iFFT and CP addition reside in the DU and the rest of the PHY resides in the CU. Option 7-1 In this option the UL, FFT, CP removal and possibly PRACH filtering functions reside in the DU, the rest of PHY functions reside in the CU. In the DL, iFFT and CP addition functions reside in the DU, the rest of PHY functions reside in the CU. Option 7-2 In this option the UL, FFT, CP removal, resource de-mapping and possibly pre-filtering functions reside in the DU, the rest of PHY functions reside in the CU. In the DL, iFFT, CP addition, resource mapping and precoding functions reside in the DU, the rest of PHY functions reside in the CU. Option 7-3 (Only for DL): Only the encoder resides in the CU, and the rest of PHY functions reside in the DU. Option 8 (PHY-RF split): This option allows to separate the RF and the PHY layer. This split permit centralization of processes at all protocol layer levels, resulting in very tight coordination of the RAN. This allows efficient support of functions such as CoMP, MIMO, load balancing, mobility. Which split function to use where? Features requirement at Radio Network level e.g. CA, eICIC, CoMP etc.